Power wheelchairs from Pride, Drive, Karman, and Golden Technologies. Designed to be pushed by a companion. Lightweight with smaller rear wheels. A wheelchair can help you regain mobility lost due to an injury or chronic health condition. Depending on the size and ability of the user, a lightweight wheelchair or heavy duty wheelchair might be for daily use or as an aid when you need to go a distance farther or longer than you can comfortably walk or stand. Traditional self-propelled wheelchairs have two large rear wheels and a pair of smaller wheels in the front. Advances in design and materials have made different wheelchair models available to suit different needs and body types. Lightweight wheelchairs are easier to maneuver as well as being easier to take on trips, when the wheelchair will be folded and stowed in a car trunk. Wheelchairs of all types typically support up to 250 pounds of body weight. For those with a higher weight, heavy duty wheelchairs, also called bariatric wheelchairs, provide a wider seat for comfort and stronger frame for durability and support. Caregivers will find pushing and stowing a transport wheelchair the easiest to use; with its four small wheels and very light weight—some are ultra lightweight—these are used to transport a patient from home to a doctor visit, for instance. (Because a transport wheelchair has only small wheels, it typically can’t be propelled by the user, unless he or she can move it forward with their feet). There can be many differences between types of wheelchairs, from adjustable features to the overall weight of the chair itself. For instance, the difference between a standard weight and a lightweight wheelchair can be as much as 10 to 20 pounds. Weight is definitely a consideration if the wheelchair is going to be transported in a car trunk or backseat or propelled by the user—some steel framed heavy duty wheelchairs can weigh over 50 pounds, though it is possible to find models that weigh less than that. On the other hand, lightweight wheelchairs often range between 25 and 36 pounds; note that this might be a “net” weight—the weight of the chair after arm and leg rests have been removed. The needs of the user will also help narrow wheelchair choices. 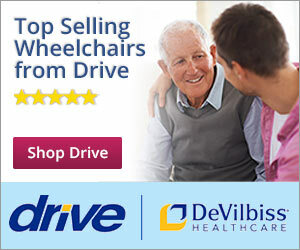 Reclining wheelchairs offer support, comfort and versatility to users who need head support and cannot sit upright all the time; they are typically between 45 and 60 pounds. The angle of the back can be lowered to make hair care easier or extended to 180 degrees flat to provide a temporary bed. Electric motor-powered wheelchairs are made for those with very weak muscles or limited endurance. A shower wheelchair or shower commode wheelchair is made to withstand the effects of water and can be wheeled right into a stall shower to make it easier to attend to hygiene needs. Options to look for include leg rests that can be elevated, detached or swung away as needed and armrests can be detached and/or flipped back or are shorter in length, such as “desk length,” to enable the wheelchair to maneuver closer to a desk or table. Some wheelchair accessories may come with your wheelchair or be available for purchase separately. These include “anti-tips,” good for the active user to minimize the risk of falling or tipping over. A seat belt may be used to prevent you from sliding down or out of a chair. Brake extensions are recommended for ease of use for those with arthritis or similar conditions. Positioning devices such as cushions, laterals, lap trays, back supports and many other similar devices can appropriately position a patient in a chair. Comfort accessories include everything from a lap robe to sheepskin arm covers, from a memory cushion to a clip-on light or cup holder.